Seamstresses and quilters are in constant pursuit of the perfect iron – one that doesn’t leak and delivers exceptional steam power. Over the years, we’ve gone through quite a few irons; some great, some terrible. We’ve been burned a time or two (literally), which is something all quilters can relate to. So, how do you find the best iron for quilting? We’re going to share our four favorite picks, but before we do that, let’s go over a few iron quilting basics. Sometimes, it’s not the iron itself, but the technique you’re using that’s giving you trouble. A lot of quilters spend so much time on the piecing aspect of quilting and completely overlook the importance of pressing (I’ve been guilty of this, too). Most expert quilters recommend creating a pressing plan, so you can avoid problems later on in the project. One of the first questions quilters ask is whether they should steam. There really is no right or wrong answer – it’s all about personal preference and commitment. If you prefer not to use steam, you may need a starch alternative just to make sure that your fabric is pressed properly. If you go with steam, all you have to do is just refill your iron whenever necessary. Of course, you’ll need to clean it, too, to make sure that rust and mineral build-up doesn’t become an issue. But ultimately, whether you steam or not is completely up to you. Always press before you cut – no matter whether you’re using fabric that’s been cut off the bolt, or scraps from your stash. Fabric off the bolt may be creased at the fold, or it may be twisted or pulled in some areas. And if you plan on washing before you cut, you’ll almost certainly need to iron any fabric that comes out of your dryer. Some quilters skip this step because the fabric doesn’t look like it needs pressing. But a tiny crease or fold can make a real difference in your cutting accuracy, which will create problems when you sew the pieces together. It’s easy to assume that you need to press hard to get those wrinkles out, but being too aggressive with the iron is a big no-no. Remember, you’re pressing seams – you’re not ironing a shirt. Go back to our homepage to learn more about sewing machines. Press with your iron tip at a 90-degree angle along the seam, and then parallel to the seam. Set stitches by pressing seams flat first. Press towards the dark side to prevent dark colors from overshadowing light colors. 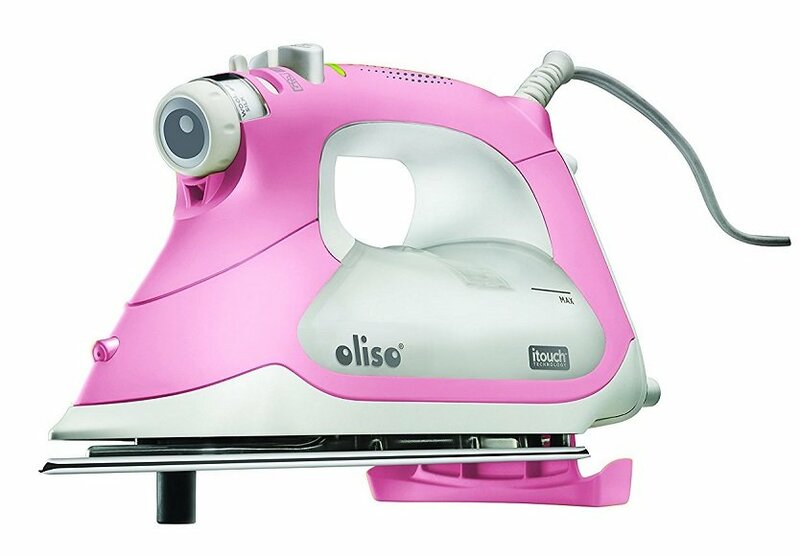 You’ve probably seen quilters rave about Oliso irons – despite their high price tags. And that’s because they offer a number of features that make fabric pressing a breeze. 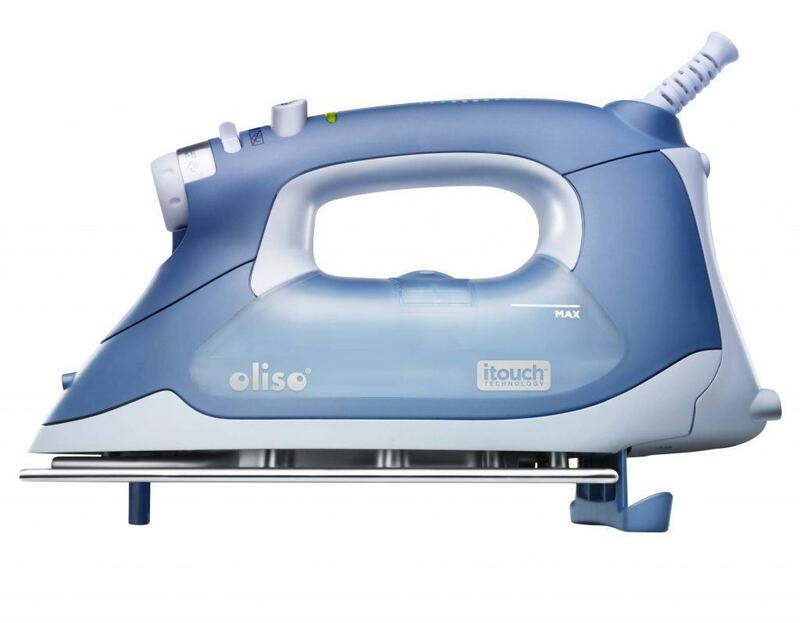 The TG1600 Pro Smart Iron is our favorite steam iron from Oliso. It’s robust, and delivers outstanding steam power and a lot of handy features to keep your clothes and sewing fabrics safe. A scratch-resistant exterior surface keeps this iron looking its best, while the stainless steel sole plate resists rust and corrosion. I’ve used mine every day for over a year and it still looks like I just brought it out of the box. The TG1600 has more steam holes than other irons to deliver a strong, steady flow of steam. I would probably be shocked if I could add up the amount of time I’ve saved not having to go over the same spot over and over again like I did with my old steam iron. Like the TG1050 model below, this iron features iTouch Scorchguard technology to prevent tipping, scorching or burns. It also levitates about the fabric, eliminating the need for repetitive lifting of the iron. With the touch of your hand, this iron can be lowered back down. I’ve found it super simple and easy to use. Complaints about leakages and burns are virtually non-existent with this iron, which is why so many quilters swear by it. I’ve never had one leak over the time I’ve used it. That was one of the most frustrating things with my previous cheap iron that I no longer have to worry about. With a powerful, consistent steam flow and convenient elevating features, this iron is worth every penny. I love this iron for so many reasons and wouldn’t hesitate purchasing it again if I needed to. If you are considering this iron all I have to say is the price tag really is worth it. The TG1050 is an affordable model in the brand’s lineup, and it makes pressing a real pleasure (no, really). The iTouch technology helps prevent scorches and burns. With just the touch of your hand, the iron’s scorchguards lift, and lower back down when you’re finished ironing. You’ll never have to lift this iron either – it levitates above the fabric. A simple touch of the hand lowers the iron down, making it ready for use. The 12.7-ounce tank is located on the side of the iron, so you can easily refill as you work. The 8’8” cord gives you plenty of room, and the iron pivots 360-degrees for complete range of motion. Perhaps the most important feature of this iron is its anti-drip system, which prevents leaking and spitting during use. The steam power is hard to beat, too. Rowenta is one of the most popular brands for irons, especially among quilters. And the DW5080 is a great option. It’s affordable, easy to use, and the steam is powerful. The sole plate is made of stainless steel and features 400 holes for even, consistent steam distribution. The stainless steel precision tip and 1700 watts of power make this iron hard to pass up. An anti-drip system prevents leaks, and the enhanced thermostat keeps a steady temperature. The 3-way auto off function offers an extra safeguard against unwanted burns. Two things we love about this iron: it has a large, 10-ounce water tank, and it has a self-clean feature. The self-clean feature takes care of flushing out any loose mineral deposits that may come through the steam. If you’re looking for a budget-friendly iron with a large water tank and powerful stream production, this model is a smart option. 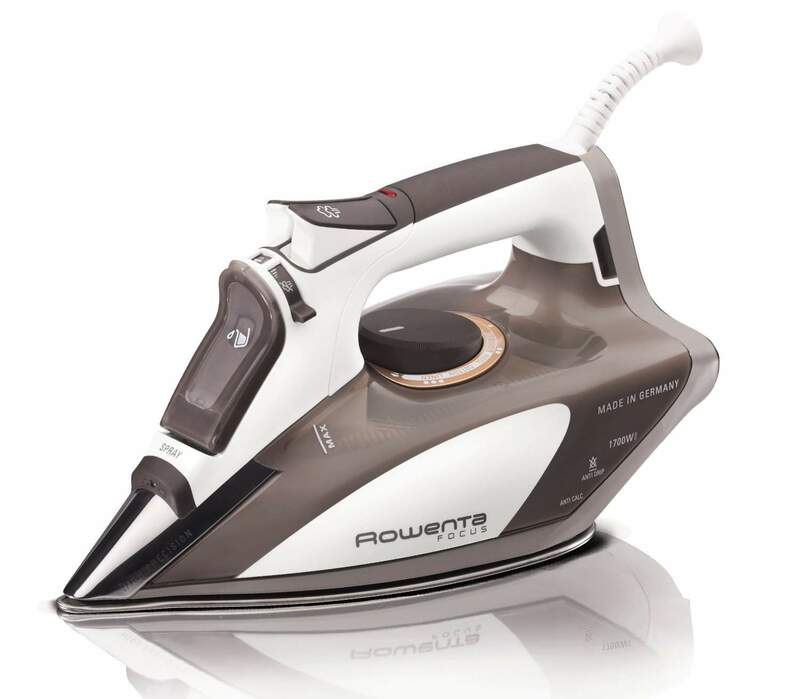 Rowenta’s DW6080 steam iron is eco-intelligent. 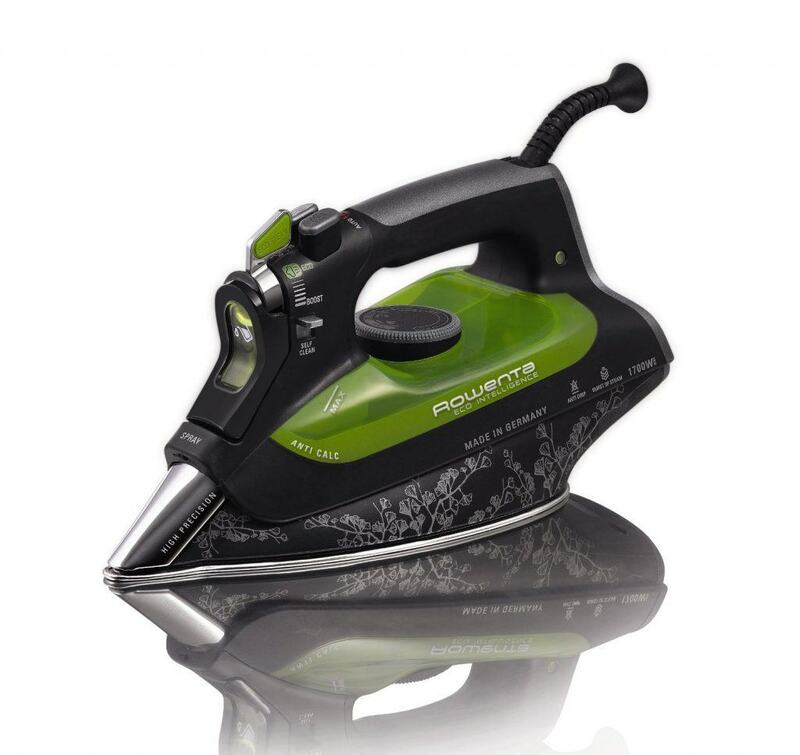 Backed with a staggering 1700-watt power, this model is designed to use 25% less energy than a standard iron. The great part is that this steam iron doesn’t lose any of its power in the process. This model is packed with features that revolutionizes the way you iron clothes and fabrics. Rowenta truly changes the way people iron their clothes. This model starts with a 100% efficiency design that uses 25% less energy than a standard iron. High performance, this model’s 3D soleplate allows for accurate steam output. The soleplate reduces steam loss, and this is what allows for a lower energy consumption than competing models. When you look at the soleplate, you’ll also find 400 micro holes that allow for even steam distribution when ironing. These holes make it simple and easy to iron out wrinkles in shirts, pants and fabric. Boost is also a great setting for creases that you can’t iron out easily. Collars, seams and buttons make it difficult to iron, but there is a quick fix for that, too. Rowenta’s soleplate has a developed tip that can be placed in these hard-to-reach places to get wrinkles out, or when trying to avoid buttons. A comfortable, rotary handle allows for left or right hand function, and vertical steam production allows clothes to be ironed when hanging, too. The water tank holds 10 ounces of water, and there’s an anti-calc system that removes impurities in the steam. These impurities clog steam holes, and they can reduce optimal steam production. One issue with the DW6080 is that only three heat modes are available. High heat settings can cause damage to certain fabrics, and the heat modes available on this unit are on the high side. So, what does this all mean? When ironing nylon or chiffon, you won’t have the lower settings available to iron these materials without risking damage. The iron wouldn’t be cool enough for these fabrics, but they don’t have a reason to be ironed in the first place. Rowenta’s DW6080 impresses at first glance, and it continues to impress after months of usage. The lack of advanced temperature settings is a minor concern, and with the high-energy efficiency of this unit, it’s a concern that’s easily overlooked. When needing a new steam iron, it doesn’t get much better than the DW6080. Click here to learn more about the DW6080 on Amazon.